If you are not one of the more than 200,000 people who have seen Vulker’s Viral Video from a very hot afternoon at Lords you can check it out on the English Cricket Facebook page. 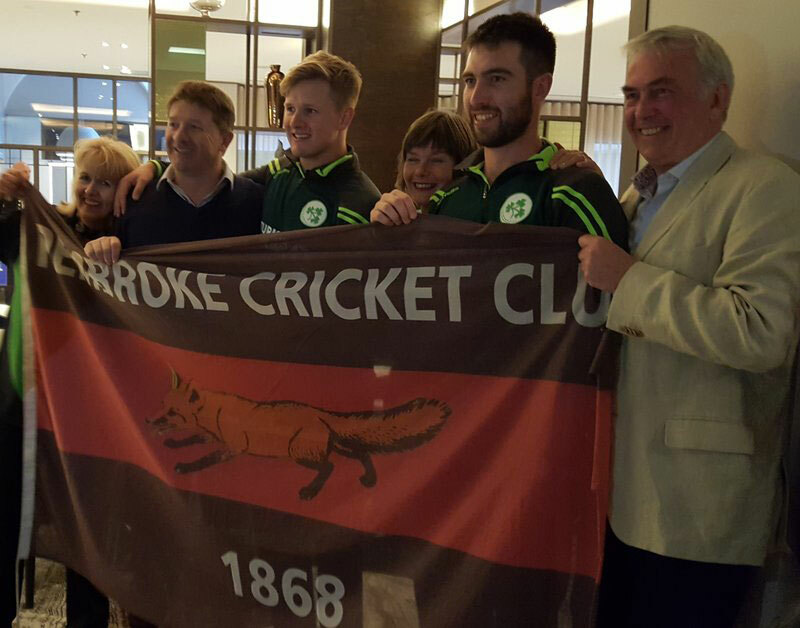 It was great to see so many Pembroke faces at Lords last Sunday, many of whom had also been in Bristol cheering on Ireland. While we may have lost both games it was fantastic to see Andy Balbernie and Barry McCarthy perform so well – as you can see from the photo there were some very proud parents in attendance. If you want to see Andy and Barry in action and give them some more Pembroke support then you can get to Malahide this weekend to see Ireland play Bangladesh on Friday and New Zealand on Sunday. The latter game could also see the appearance of Scott Kuggeleijn. Scott’s father Chris played with Pembroke 30 years ago before gaining a number of caps for the Black Caps. While Andy and Barry are starring with Ireland Josh Little and Lorcan Tucker will be in the Ireland Wolves squad for games against both touring teams – against Bangladesh on Wednesday (sorry this newsletter is a little late for that) and New Zealand in Rathmines on Thursday (T20 game at pm). If that wasn’t enough international excitement, last Tuesday saw Shauna Kavanagh star for the Irish Ladies against Zimbabwe in the quadrangular tournament in South Africa. Shauna top scored with 53 (her maiden half-century) and then took 2 wickets in the Zimbabwe innings. Unfortunately Ireland lost the game but with performances like that it is only a matter of time before they start winning again. You can send your best wishes to Shauna on her Twitter feed. Back at home the Ladies 3rds are home to Greystones on Thursday at 6pm. I believe Becca is looking for an umpire – even if you can’t umpire the Ladies would appreciate your support. On Saturday the Furious Fives get their league campaign underway with a trek to the country to play Halverstown – if anyone wishes to join the intrepid band please contact Stephen Moore! While the 5ths set off on their epic expedition the Men’s 1st team are home in the Irish Senior Cup against Galway – the first time we have played them so your support along the wall on Saturday would be appreciated. Sunday sees Joe Doherty’s 4ths at home for the first time this season against Knockharley and Joe will be looking to continue a strong start in Division 8. Next Monday our Boys Under 13s are home to The Hills while on Tuesday our Boys Under 11s are away in Merrion. Tuesday also sees the first T20 game of the season with the Men’s 3rds/4ths combination in action in the YM Salver away to YMCA in a preliminary round. We wish all our teams and representatives every success in their upcoming games and please do your best to get out and support – it really is appreciated by all the players (you are excused for not making the trek to Halverstown!). Off the field, the building work on the hall and showers has now finished (apart from new windows and a new floor for the hall). I hope you will agree that the improvements were worth the disturbance. We are currently progressing a new application to Covanta that will include a separate changing area and shower block with updated toilets that will be fully accessible. We are working with an architect on plans and will let you see them as soon as they are available. Lastly, but by no means least, I want to pass on congratulations to Emmett Whaley and Marie O’Sullivan on the birth of their beautiful baby boy this week – the Pembroke family continues to grow and I wish Emmett and Marie many happy times ahead.